This is a story about a rise, a fall and a slow spiral upwards. The Ashley family has been documented for over a thousand years. The powerful and successful Ashley-Cooper family came about mid 17th century. To mark this upsurge it was decided to build a mansion in a 5500 acre park near what is now known as Wimborne St Giles. Construction began in 1651. The house was built quadrangular and, when completed, the gardens were developed. A large serpentine lake is fed by the River Allen. A wide avenue of beeches was laid down (now very much mature) and the formal gardens and a grotto were added. A painting of the house in 1862 shows that it was crenulated all the way round but 100 years later almost all of the crenulations were dismantled. The family prospered and the house was well maintained, but slowly began to fade as we neared more modern times. In World War I the house was used as a hospital and in WWII it became a school. The slide had started. By the turn of the present century the house was in a bad way and the incumbent Ashley Cooper was making a valiant but doomed attempt at recovery. The Earl then married a woman of whom his two boys disapproved. Nick Ashley Cooper looked at the situation, accepted his older brother would eventually inherit, so he packed his bags and became a dance music DJ in New York. Then tradegy struck hard. First his father was murdered and then his elder brother died. He found himself in possession of and Earldom and a run down house. Pulling himself up by his bootstraps, ably supported eventually by his new wife, the decision was taken to try to properly restore the house. His success is ongoing but palpable. Much of the house has been restored and eventually it is intended to open overnight accommodation for visitors. Meanwhile the lucky ones can visit the house - with the Tapestry Room, North & South Drawing Rooms, the Library and Stone Hall already available to the public through staging weddings, conferences and concerts. The grounds are used throughout the year to host a number of events, including a 4 day Colourfest and the popular Grand Shaftesbury Run through the grounds. This sharp cold snap has come at the wrong time. Minus 9 degrees and now half the leaves from the three big trees are waiting to be shifted. First, however, was a trip into town in order to make our wills. We haven't made one for over 40 years and I'm a bit worried about Margaret and Gerard having to take responsibility for our children! We did some food shopping (just for the next three days) on the way home, then Pauline went off to help wrap presents for children in Africa and I went to the dentist. For the first time in living memory I was called in at the time I was booked in. Ironically I had misread the text that told me to go there and I sat for an hour in the waiting room because I was too early. Whatever, I had Terry Pratchett with me and the hour flew by. The first time I visited Salisbury Cathedral was just after Edward Heath had lost his position as Prime Minister. He lived on the edge of the close, as was evidenced by the police guard that was with him 24 hours a day. The close is so large that it is easy to miss what is happening around the periphery. The cathedral catches you at first glance and only gets better the closer you get. 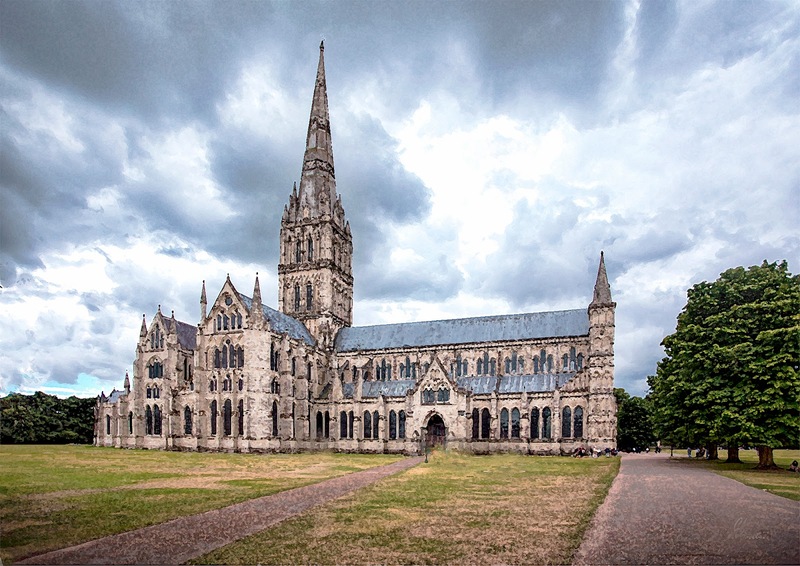 Many of Britain’s oldest cathedrals and abbeys are built on the site of former places of worship, but not so with Salisbury. The cornerstone was laid in 1220 and the cathedral was mostly completed in 1258. The spire stands higher than any other in Britain. At 404 feet (123m) it was not expected by many experts to be still standing today, yet there it is. The cathedral is home to one of the original copies of the Magna Carta, but this one is said to be the best preserved of all the survivors. The clock is also a long term survivor having been put in place in 1386. If anything the cathedral seems higher inside than it does out. The nave is narrow by some standards and this has helped to accentuate the height. There have been many adjustments, repairs and alterations over the years, but all in keeping and the cathedral remains one of the grandest and popular in England. The main body of the cathedral was finished by the consecration on 29 September 1258. But the whole project also included the West Front, the Cloisters, the Chapter House, and the (now demolished) detached Bell Tower, which stood between the High Street Gate and the Cathedral. All of these were probably completed by 1266. The great energy being released in Salisbury was not confined to this building project. The new town also became a notable centre for education, with the foundation in 1261 of De Vaux College, and then of St Edmund’s College. Cathedral clergy were required to give theological lectures to their students. Since the universities of Oxford and Cambridge were only just developing at that point, there was some chance that Salisbury would be their rival. 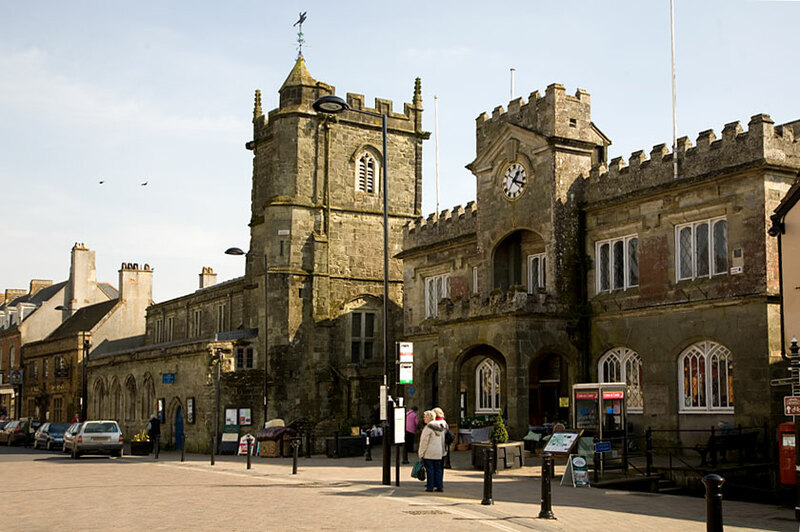 By the later 13th century the Bishop’s town of New Salisbury, around its huge new market place (still in use on Tuesdays & Saturdays) was a great success, and many new shops, houses and businesses were built in its ‘chequers’ (blocks). 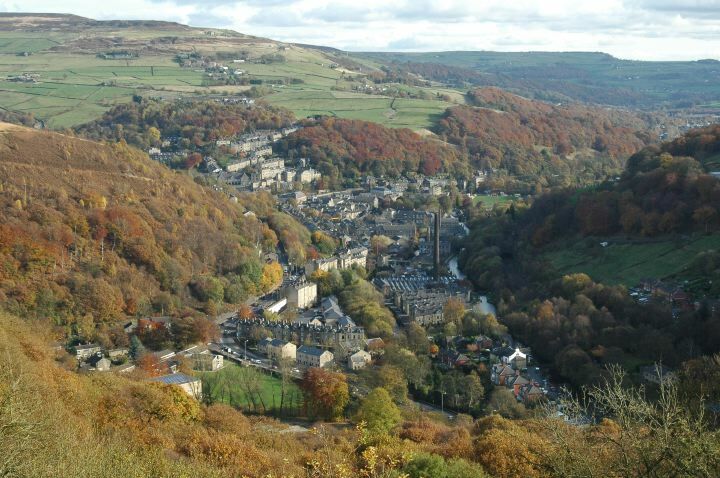 Within two centuries it was the seventh largest town in England. We woke before the children, but not before Robert. He starts his day around 5.30am, and today threatened to be a midnight finish. So we got up to be sure to see him off. The rest of the house emerged, we all had breakfast, Pauline packed, Sheri took Daisy and Harper to school and we got on the road. This has been a lovely, relaxed weekend. I drove the first half, which went well once we were clear of Bracknell. Pauline drove from the Oxford Services and that was a lovely run in beautiful sunshine. We were home by 11.30am. This afternoon I did a little bit of work whilst Pauline took Rita to the Knitting Club. Then we went to the Gartmore Riding for the Disabled at Hammerwich. This is always impressive, and gets more so with every passing year. I shall do a separate post about the riding school when I have all the information. 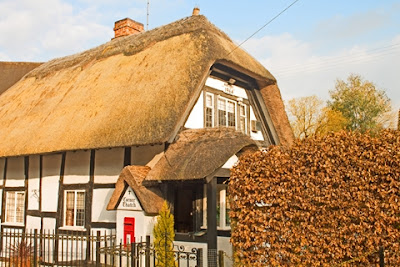 From there we went to the Nelson Inn at Creswell Green, a hamlet, so the pub relies on passing trade. With the food that they served the 14 of us, they deserve plenty of passing trade. Well done. It was minus 2 when we got home. Not a good arbiter for the days ahead. 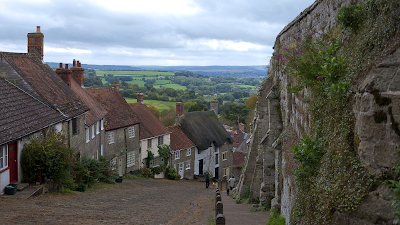 It was Bill who arranged our stay in Shaftesbury. It was a reunion for the Past District Governors of 1993/1994. Bill was so familiar with Shaftesbury that he didn't think to tell us about the place. Instead he took us on a trip to Bristol! On the Sunday morning we woke early. It was the first weekend in September and the weather was still balmy. 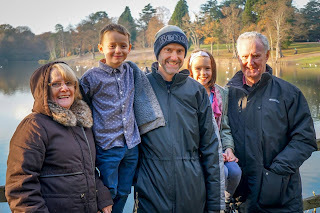 We decided to have a look at the town and went for a walk before some of the others surfaced. We found ourselves heading towards the abbey. 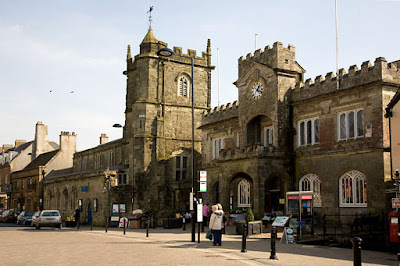 There are some who say that Shaftesbury has a history preceding the Romans but most historians say it was the Saxons who established the town, and it was certainly King Alfred the Great who had the Abbey built in 888. With the abbey prospering, so did the town, but in 1539 it fell foul of the Dissolution of the Monasteries and was torn down. The ruins are still there to remind us of a glorious past. only steadily and is now around 7,300.
bread. This intriguing little road was empty of traffic and so the illusion was complete. A blissful undisturbed sleep. Whether it was the change of bed, sleeping with the curtains drawn to or just being away from the day to day pressures, I couldn't tell. You are always sure of a hearty breakfast from Robert, and so it was again today. Then it was off to Woking and Sunday church. I quite enjoyed this morning. There is a look on the faces of the congregation to say that they also feel content to be there, especially as you are welcome to take your pew armed with a cup of coffee. The sermom was delivered in a style I haven't come across before. There was quite a bit of humour but views expressed from angles I'd never considered. It wouldn't matter what religion you are, or what branch of Christianity, the sermon would have resonated with everyone. That is quite a skill. Afterwards we did a little shopping, then back for a snack before we took up all of Robert's afternoon getting him to try to activate Pauline's new phone. It didn't work. 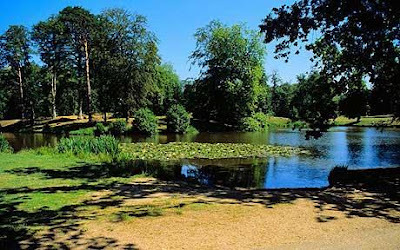 A few miles north of Woking is the town of Sunningdale and close by is Virginia Water. The main attraction here are the lakes and woodland. Virginia Water makes up the bottom part of the Great Windsor Park. The main lake is mostly in the county of Surrey, but the top half and the rest of the park are in Berkshire. In late November there are still signs of The Fall, but the surrounding bushes and copses let you know that if you visit in early summer (which we will) you will see a plethora of colours, especially when the rhododendrons are at their best. The whole area is far too much to explore in one day. 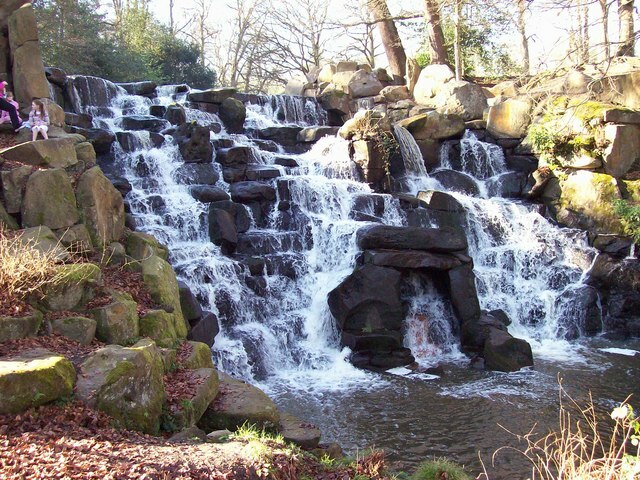 The part from Virginia Water to the Windsor Park is four and a half miles long. The lakes are quite famous without being known as such. Several films have featured the lakes, in particular the Harry Potter films. At first glance there doesn't seem to be much more bird life than plain wood pigeons, but as you get further from the road and closer to the water you start seeing herons, gulls, geese and ducks. We saw guillemot, coot, moorhen, jackdaws and grey wagtail, plus Egyptian geese. On our visit the park was so full and popular that there was no chance of spotting animal life. Our next visit will be longer, warmer and mid week to avoid the crowds. This was a lovely, relaxed day, far away from the normal pressures. We all got up at our own pace and enjoyed the fullest of breakfasts. By the time the last head was off the pillow that sky was clearing and some blue could be seen. We took the morning easy and then this afternoon we drove up to Viginia Waters and explored the bottom part of the lakes. The number of visitors was impressive, but the park is so large that once past the entrance it is easy to find elbow room. From there is was in to Sunningale and coffee, though I had a decadent hot chocolate that will bring me back again - and again. We had the best of the day outside and then returned for an hour of David Attenbrough and The Lonely Planet, and then it was back to great food and conviviality. Our daughter Helen was looking for a country retreat that would be half way between High Wycombe and Lichfield. 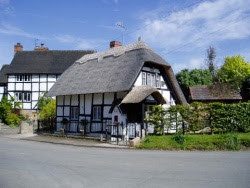 She found a cottage in Worcestershire and we duly arrived in a picture book village of 250 people, all of the ones we met being very friendly. It's doubtful we would have found this village ordinarily because it is a little off the beaten track. Once ensconced we quickly began to bemoan the fact that we wouldn't be there longer. To a country bumpkin like me, Abbots Morton is idyllic. Obviously we weren't the only ones to feel that way because the Abbots of Evesham Abbey built a moated retreat in the village. The ruins of the house (possibly a casualty of the Dissolution of the Monasteries) and evidence of the moat can still be seen. St Peter's church is at least 1,000 years old and was built on the site of a Saxon church. 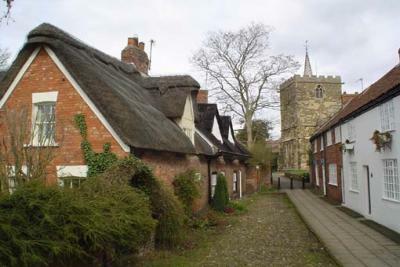 It is not known how long the hamlet has been inhabited, but certainly 1600 years. The church grew over the years with several extensions and rebuilds, but most of them were completed about 600 years ago. We woke quite early and once day break arrived we could see that it was a clear blue sky. There was no race. Pauline had got everything ready for the weekend but I still had to bring suitcases down from the loft. I took all the sacks to the Sorting Office and then loaded the car. The lady from Wiltshire Farm Foods arrived and we took a week's supply round to Rita and then we were on our way south. The beauty of a cloudless sky at this time in November is that the sun is so low that it lights the countryside from a different angle. The downside is that if you are driving south, the sun is in your eyes for much of the journey. Nevertheless, this was one of out best trips down to Woking (Horsell Actually!) and we were with Robert and Sheri in time to share lunch. Daisy and Harper joined us from school and we settled for a convivial afternoon and evening. The changes to the house are awesome, much better and grander than I had imagined. We'd seen the drawings but hadn't realised the scale of the house extensions. Very impressive. When I began to become more involved in Lions Clubs International I found myself heading for North Wales on a fairly regular basis. I favoured three different routes, to avoid boredom, and when I was OK for time I picked the A5. This road was built by the Romans and runs from the London area all the way to Holyhead on Anglesey, passing very close to Lichfield. 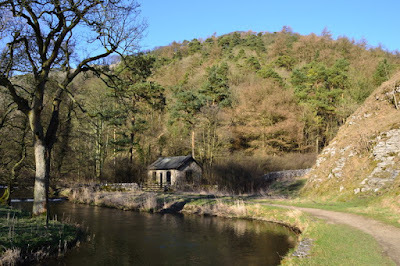 The A5 passes through some very pretty countryside and Llangollen was one of the first places in Wales that I would encounter. 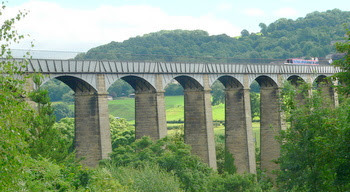 For a very long time I simply drove through the town of 4,000 people, taking notice only of the Pontcysyllte Aqueduct that hangs high over the River Dee as it carries the Llangollen Canal and is a highlight for every small vessel on the canal. It always inspired the thought that is would be an adventure just to cross so high above the valley. After a while I became aware that Llangollen is where the famous Eisteddfod takes place every year, bringing in an additional 120,000 people, and then I began to meet with the local Lions Club and learned a lot more. Turn off the A5 into the town itself and you cross the bridge that was first built in the 16th century. The Dee at this point is quite lively. It is here that Saint Collen was said to have arrived in a coracle and built a church in the 6th century. 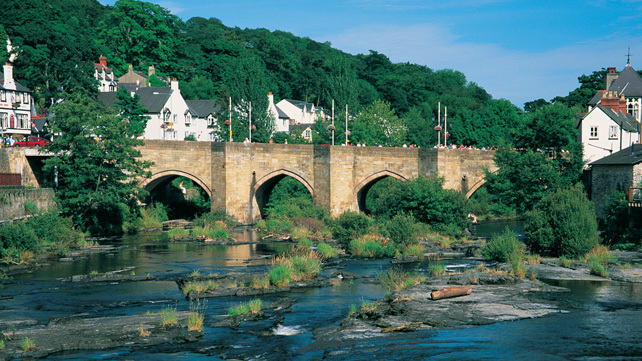 With the Romans marching up and down the A5 some 2000 years ago, and the River Dee being crossable at that point, the town has been inhabited for two millennia. As the town grew, so did the bridge. It was expanded two or three times, but each change was wrought with bricks that matched the originals, so that changes were in keeping. 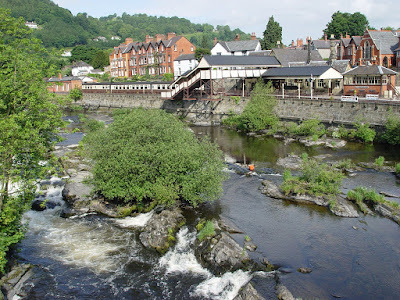 I began to realise that there is a lot more to Llangollen than first meets the eye. The Berwyn Mountains provide a beautiful backdrop, the aqueduct is eye-catching, there is a motor museum and an old steam railway. 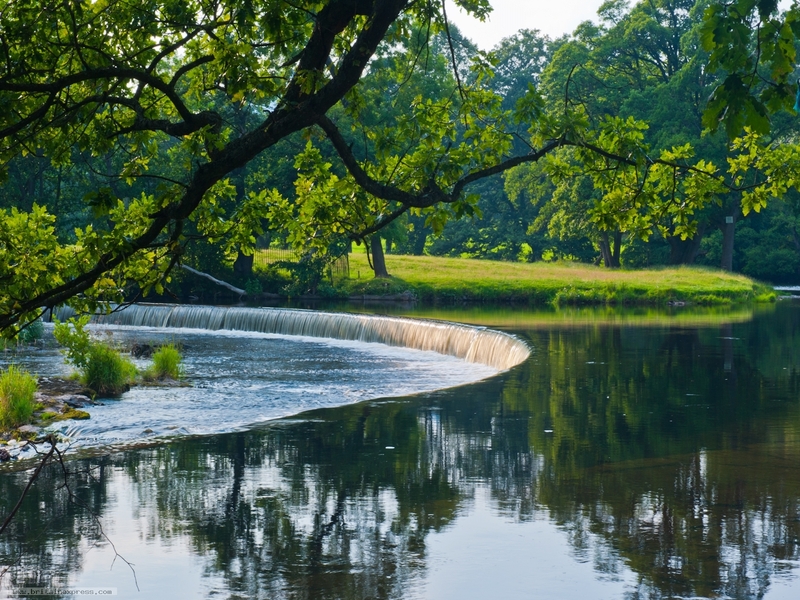 The River Dee also provides the horseshoe falls that attracts photographers, especially when the river is high. Just outside Llangollen is Plas Newydd. 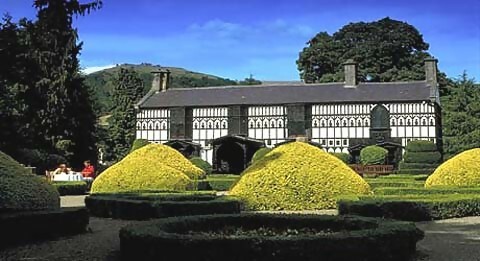 Plas Newydd Llangollen must not be confused with Plas Newydd on Anglesey. Originally Plas Newydd was an uninspiring cottage but somehow the ladies known as Eleanor Butler and Sarah Ponsonby started a social gathering that seemed to attract anyone with a W in their name. As the likes of William Wordsworth, the Duke of Wellington and Sir Walter Scott became visitors the cottage was expanded and extended to become something more in keeping with the expectations of the hierarchy. Today Plas Newydd is run by the National Trust. It is a photogenic building from the outside, which is just as well as photos inside are not allowed. Fortunately I made an early start. I was well ahead of myself when, mid morning, Peter O'Brien messaged to say there was a problem with last night's recording. I knew he is up to his ears in work so I told him not to worry, and I recorded the Welsh news from home. So that was the morning gone. I took my usual three ladies to the Live at Home Scheme. Where I sit them in the car is important because one is deaf and another has dementia, and that can lead to some very loud and confusing conversations. I went to the studio and ran off everything that had already been recorded and that just left me enough time to collect the Lichfield Mercury and go and take the ladies home. We were well staffed tonight. Four readers, Keith on recording, Ben to do the Lichfield returns (with Alexander learning what he does) and Peter Fox back. We got everything finished nice and early, I stopped for a chat with Peter and I was still home for 9.30pm. West Wycombe is a village in Buckinghamshire that is run by the National Trust, who also control West Wycombe Park (which we will deal with in the Spring) as well as St Laurence Church and the Hell Fire Caves. Wander around the village and it is a step into the world of Charles Dickens, with quintessential shop fronts to remind you of your childhood (if you are as old as me! ).above the village rises a hill atop of which is the St Lawrence Church and mausoleum, and beneath which are the Hell Fire Caves. If you have seen the film 'Bridget Jones Baby' then you will have seen some of the interior of the church because some of it was filmed there. The church is on the top of the hill, crowned with a golden globe. The original church, sited high in the Chilterns for everyone to see, was built around 635. The current church was built 1761-1763. 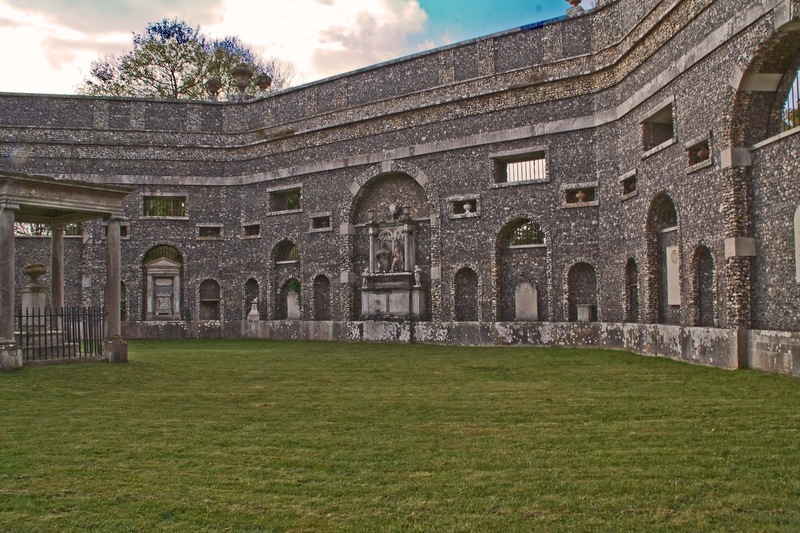 The tower was deliberately raised so that could be clearly seen from West Wycombe Park, and the interior is Egyptian in style. The Mausoleum area is quite large and strangely thought provoking. The Hell Fire Caves were so named because they were an occasional meeting place of the notorious Hell Fire Club, founded by Sir Francis Dashwood and drawing in many famous names of the day, particularly those wishing to view or experience immoral acts, but stay clear of Parliament and any stray eavesdropper. 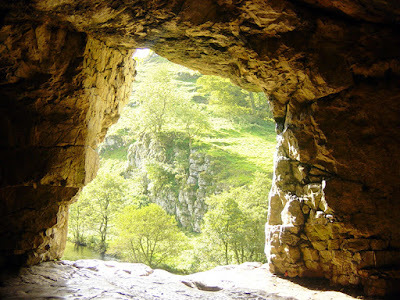 The journey deep into the Hell Fire Caves tells you they were safe from intrusion, and it is worth a visit if you are in the area. As Wednesdays go, this was slightly tougher than most. I didn't mess about this morning. I made a loaf of bread and cleared the decks a little, then went to the Sorting Office for the returns. The man came back with one sack with about 15 envelopes in, saying that was all there was. I politely asked him to look again and he found another five full sacks! Pauline had her own agenda, but gave up two hours to help me and we had checked every envelope and turned all the labels by mid day. Pauline then took Rita to finish her Christmas shopping whilst I got the TN ready for this week's recordings. Over last night and this morning, five new listeners had come in, which added an extra hour, so it was 4pm when I finished that function. Next it was downloading the Welsh news and preparing the programmes for this week. A quick meal and then into the studio for Peter and Jayne to do tonight's recordings. I was home for 7.30pm and had, by then, had enough for one day. I grew up in a town that was half ancient, half modern. Today the population of Britain is so much higher that swathes of our towns and cities are overpowering the ancient, but if you look hard enough you can still find history. 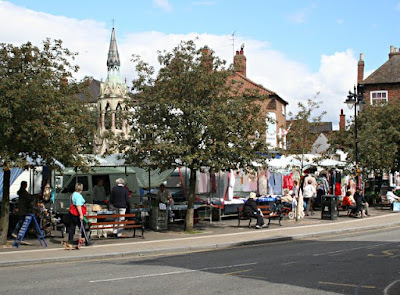 When I first went to Horncastle in 1955, most of it was just like yhe town I came from. The parents of my old school friend had bought a pub in Horncastle and had plenty of accommodation so that I could stay for a few days. The pub was quite close to an egg processing unit and I was sent every morning to bring back the rejects. These were the days of the little Lion stamp to show that the eggs had passed muster. If the egg was a double-yolker it failed. Those were the ones we bought (two for the price of one!). 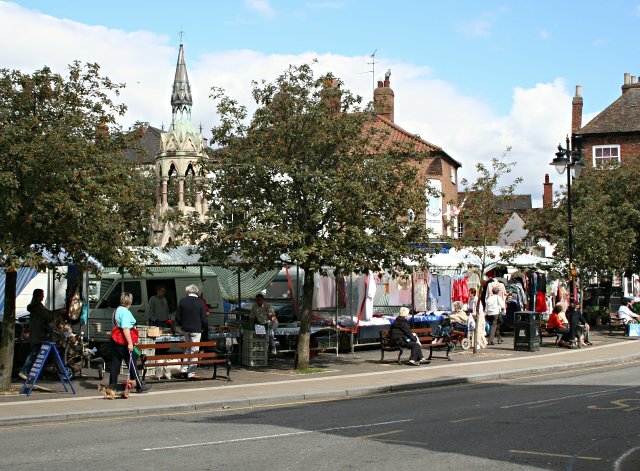 Horncastle sits 17 miles east of Lincoln. The population is under 7,000. There have been activities at Horncastle for at least 2,000 years. The town wasn't on any major route but nevertheless the Romans set up an establishment and walls and relics can still be seen. 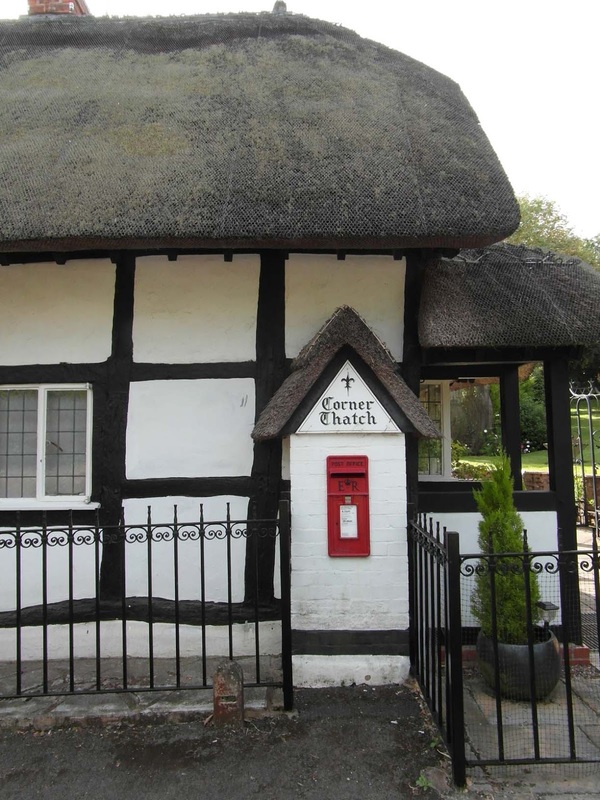 By the time of the Domesday Book the population was only about two hundred and fifty people. In the absence of any other major attraction I always turn to the local church. It is likely that St Mary's is the third church on the same site. It is believed the Romans built the first church. 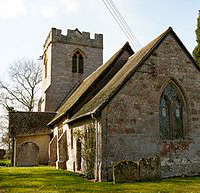 That was replaced by a Saxon church which in turn gave way to a Norman church around 1250. Changes were wrought over the centuries, as evidenced by three different styles. The Nave is in the early English style, the Chancel chapels are in the Perpendicular style, and there were several alterations all around the church in the Victorian style. A lot needed to be cleared from my desktop because of being away at the weekend. I wouldn't be able to do my usual catch-up. I did some work on the Talking News and cleaned some spoiled return wallets. We can't afford to just discard them. Pauline went off to meet Gill at Ventura Park, so that gave me three hours, which I put to good use. After lunch I walked into town and visited two banks. At Barclays it was a small cheque for the Talking News. At Lloyds it was a small cheque for us and a lot of cheques for Lichfield Lions. Then I went to Conversation Staffordshire at the Guild Hall. This was an event organised by Healthwatch and the National Trust. It seemed to be poorly attended and there was already Bev and Judith there from the SNA, so I didn't stay too long. So I went home and downloaded the Scottish News for tomorrow. If you lived in the Midlands during the forties and fifties, you could easily travel north, south, south-east or south-west, but journeys to the west (Wales) or the north-east were difficult. The Romans had built a brilliant road system, but they spread like spokes in a wheel from the London area and going cross-wise was difficult. As a teenager I would go off on long hitch-hikes, but following the more popular road system involving the Midlands. However, when an old school friend moved to Horncastle in Lincolnshire I decided to pay a visit. It took me a long time to get there. It was not until the motorway system was developed and the A14 took travellers eastwards that it became easier. Having enjoyed a few days in Horncastle I decided hitchhiking back would take too long, so I would go by train. This involved getting to Lincoln and starting from there. I had a few hours to kill and was struck immediately by the cathedral (see MM in March 2016). It was quite a few years before I got back to Lincoln and once again I was drawn by the cathedral and it was not until my third trip that I discovered the castle. Seeing as it is such a large building it might seem strange that I didn’t find it straight away, but my mind was on other things. 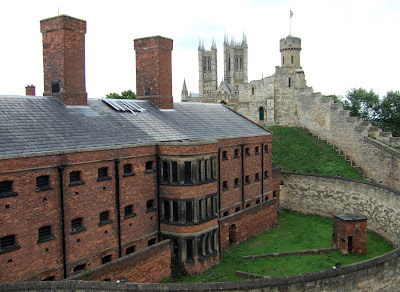 The north-east of England was a thorn in the side of William the Conqueror and he subjugated it brutally. Having left Yorkshire almost deserted he turned his attention on Lincoln, which already had a large population by the standards of the day. The Romans had built a fortress on one of the higher points. This was now in ruins so the site was cleared and the Normans constructed one of their largest and most impressive castles in its place. Lincoln castle has two mottes. 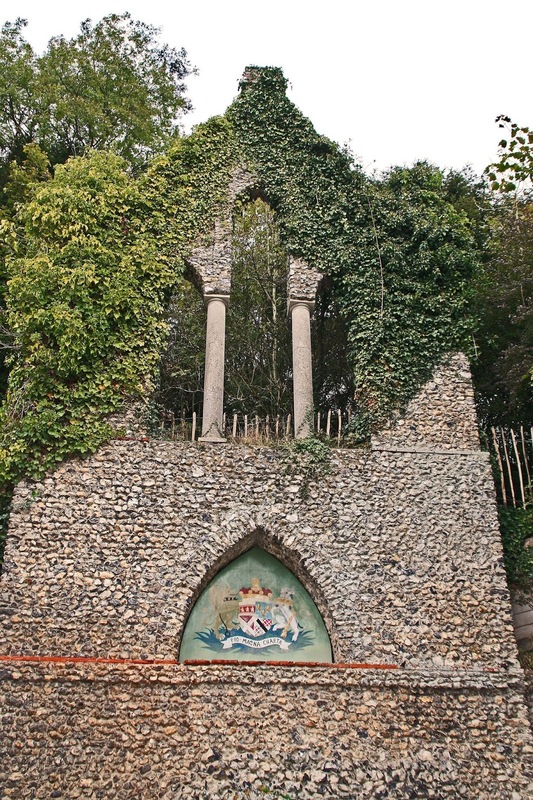 The only other surviving castle in England built with two was Lewes in Sussex. The castle grew over the next two hundred years, mainly because it was besieged twice. Although it survived both attacks, it was decided to make it even more imposing. That was useful because it changed the fate of England at a crucial time. The Magna Carta was signed in 1215 (there is an original copy at the cathedral) but King John was not happy and called on the French to help him restore his power. 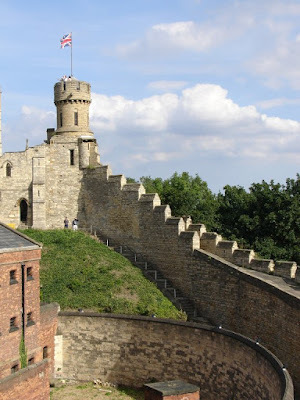 Lincoln Castle got in the way and withstood its biggest siege. Had it fallen, England would likely have come under the rule of France yet again. 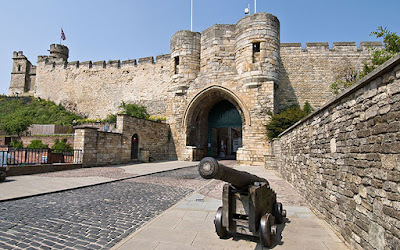 The castle was besieged again in 1644, during the English Civil War. This time the opposing force was too great and the castle surrendered. There is a very detailed description of the various parts of the castle on the official website. There is no doubt that we are having it easier than many parts of Britain. The rain here is unpleasant and cold. The rain elsewhere is causing floods and misery. I started with a meeting at home with John Morgan and Dawn Perry of the Staffordshire Neurological Alliance. Because we have lost a couple of the more active members (it's the nature of the beast, unfortunately) I have been asked to take on a couple of extra roles. This I'm happy to do, but it has to be without encumbrance because time is becoming even more precious, and not just because I've used more of it than I have left. Next was the funeral of Brian Zavou, a one-time member of Lichfield Lions. Brian and Pat were friends and very active with Lions until Pat started to become ill. When she died it seemed to drag Brian down, but although he had left the club he was still playing golf and meeting other ex-Lions. So I was surprised that so few were at the crem. John Cassie was there and so were another couple from the past, but that was it from Lichfield Lions. When we got back the rain was heavier and even more unpleasant, so I abandoned my plans to go into Lichfield and we had a gentle afternoon with Pauline wrapping Christmas presents and me only working when my conscience got too powerful. Hebden Bridge is a market town not far from Halifax. At first glance it looks a bit grim, but look beyond the grey brickwork and you might find why the town of 4,500 people has been crowned the "4th funkiest town in the world!" People have lived in the area for eons but it was when industrialists decided that the River Hebden could be harnessed that Hebden blossomed as a mill town. 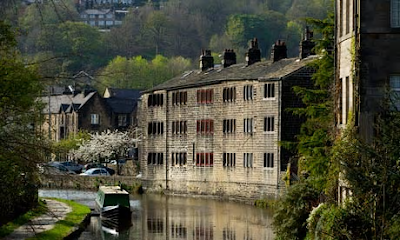 With a lovely river and a popular canal passing through the town, plus the beautiful Pennines hovering all around makes this a lovely place to visit. The surrounding hills, woodland and waterways offer peace to the rambler and joy to the wildlife observer. I have only ever seen dippers in Scotland, but they can also be found around Hebden, as can less common birds such as tree creepers and spotted flycatchers. This was a lovely, gentle day - in the Midlands. Elsewhere is was storms and floods. There was even time to think. I got everything ready for the bank tomorrow and then did my blog. A friend had seen my blog and said he didn't understand why I would say the pressure on my time is growing all the while, yet I still find time for my meanderings. I told him that I squeeze it in and I find it therapeutic. It is my memories for the future and I am also revisiting (often virtually) everywhere I have been in my past. 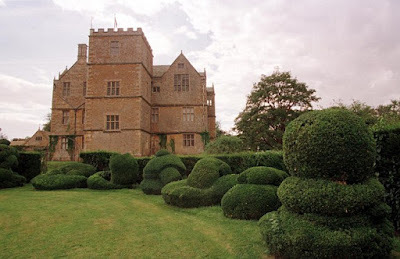 "Really," says he, "You mentioned Broughton Castle. When have you been there?" I said that he should remember that as he was with me. "But that was 30 years ago!" I agreed, I didn't say it was yesterday. Rita joined us for a gorgeous Sunday roast. Pauline insists that a roast only ever tastes that good on a Sunday. The rest of the day was simply relaxation. Dovedale rightly draws most of the plaudits from visitors to the gorgeous Peak District, and those who set off from Dovedale to follow the River Dove will find other gems, many much lesser known. 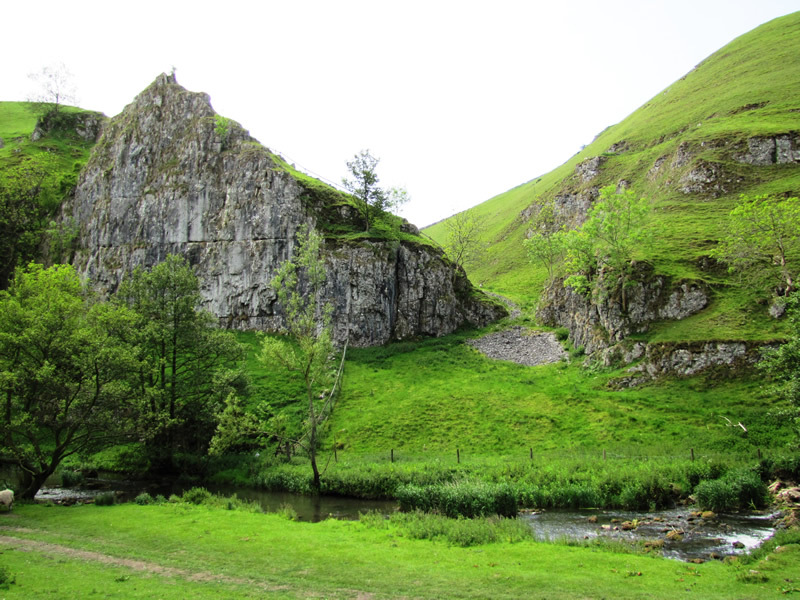 One of the beauties of the Peak District is that if you don't want to climb all the hills and tors, you can find plenty of flat ground to walk and admire the views from a different angle. 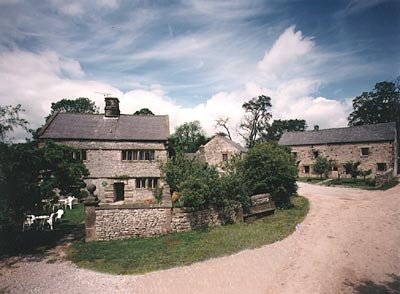 The Tissington Trail is a great example. Being an old railway line, it is quite flat and lets you carve your way through the landscape without raising a sweat. (You can hire a bike if you want to traverse the full length of the trail). 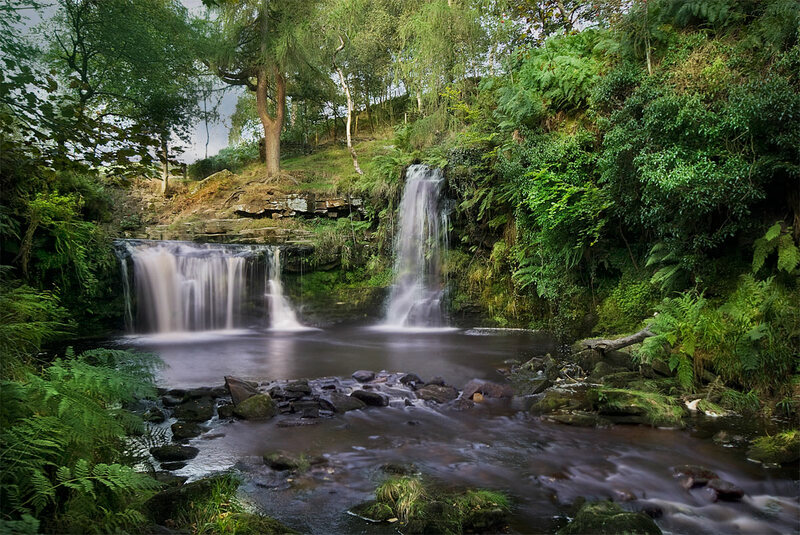 Wolfscote Dale is one of those lesser known areas, but well worth a visit, whether for a short or long walk. 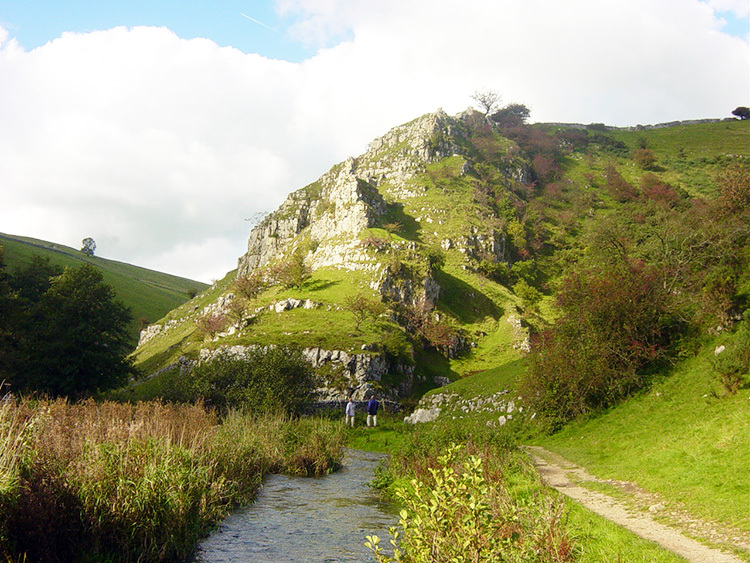 The really adventuresome can start at Biggin at the top of the Tissington Trail and walk south until they reach the Dove. Others can start from that point, at Lode Mill, or those just wanting the follow the river can begin at Hartington. At this time of year it can get muddy close to the river but for much of the year it is trouble free wandering alongside the scurrying Dove, below the peak of Wolfscote Hill, or across the Coldeacon Bridge and up to one of the caves that can be found at either end of the trek. There was quite a lot to do from last night, most of it unexpected. With our Club Secretary sunning it up in Thailand, all the money and cheques from Charter were passed to me to bank. Would that everything had added up! To begin with I couldn't make what I had balance with what I was told I should have. After four attempts trawling through the cheques and recounting the cash I was still £10 over. Not a bad problem to have, but I checked with Mike Knight. "Oh," he said "I forget someone gave me £10 for the raffle." Then someone came round and dropped off a cheque for £55, and his table was fully paid up. So I don't know what to do with that. We drove up the Burton on Trent. The A38 was blocked (yet again) so we cut across country through Walton on Trent. Last week all the trees close to us had been golden. Today they were almost bare (though the ground was now golden) but once we crossed the Trent we passed pastoral landscape that was still alive with the colours of autumn. John Cassie joined me (whilst Pauline went shopping!) and together we shook collecting cans for two hours, raising funds for Barton under Needwood Lions. There was a lot of footfall in the arcades but only about one in twenty donated. Nevertheless we had some pleasant conversations with those who did stop. Tonight I cooked. Pork chops baked on a bed of onion, mushroom apples, cheese on top and then covered in strong cider. Mashed potatoes with swede and peas for some greenery. I also fried more of the apple in maple syrup and placed it on top of ice cream for an attempt at a sweet that I very much enjoyed. 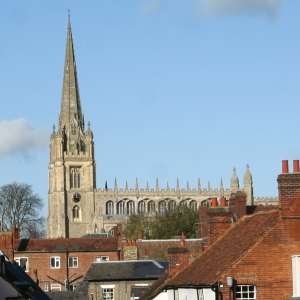 Saffron Walden is a market town in Essex, nearer to Cambridge than it is to London. The town got its name from the saffron crocus which was the mainstay of the local economy for about two hundred years. Saffron Waldron has a lot to offer. 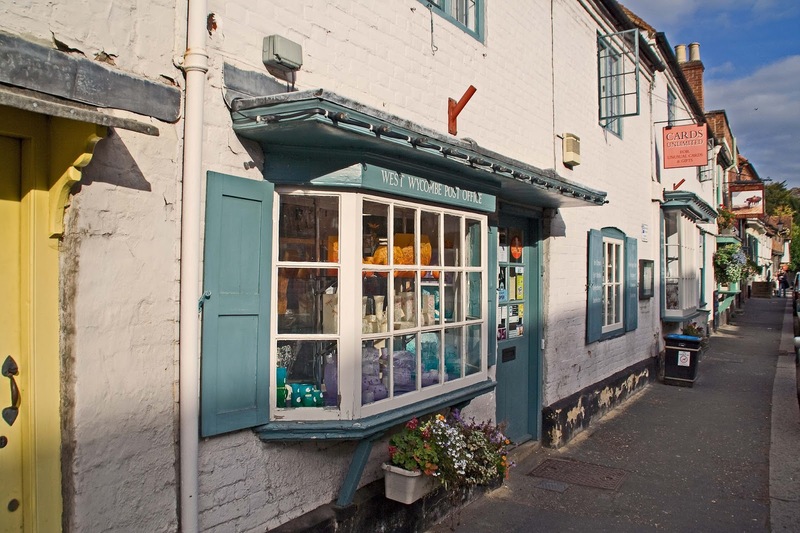 It has a lot of shops and an old fashioned High Street and Market Place (operating every Tuesday since 1295) that make spending a day in the town very pleasant, especially on a sunny Saturday. 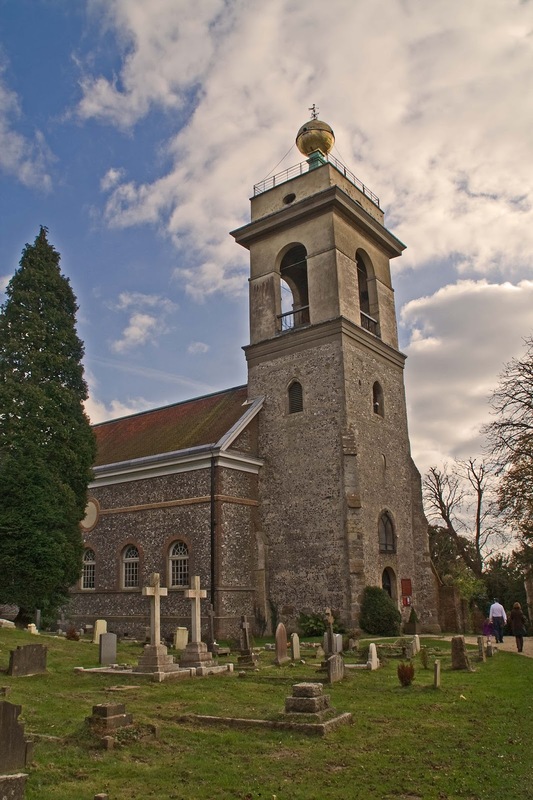 St Mary the Virgin church is a short walk from the centre, as is the museum and Bridge End Gardens, which have been restored with help from the Heritage Lottery. 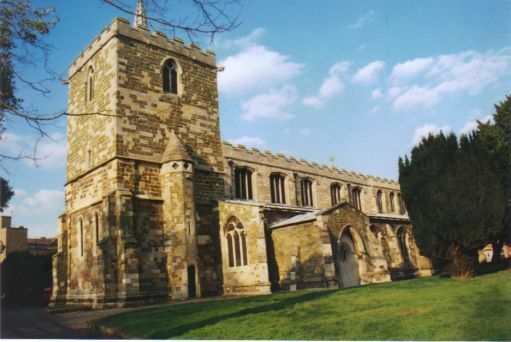 St Mary the Virgin dates from the 15th century and was built on the site of an earlier church. It has suffered occasionally throughout the centuries, requiring several repairs, and the spire was only added in 1832. The intriguing Turf Maze is on the common not far from the church. There is evidence that the area has been occupied for at least 4,000 years, if not longer, though most of the older property still on view is mainly from the 15th century. After the Norman Conquest there was a mansion house built where Audley End House now stands. A castle was constructed, but this soon fell into disrepair and when Thomas Howard, 1st Earl of Essex, took control he made a start on the Jacobean Audley End House. This was built in the grandest style (mainly for the benefit of entertaining royalty) and utilised many of the stones that had been the castle. 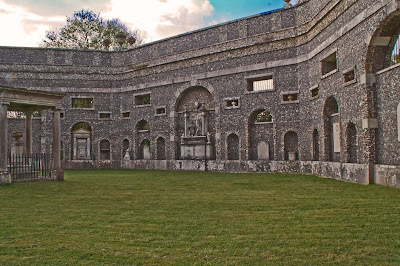 English Heritage now manages what is left of Audley End. Huge as it still is, it is only one-third of the original. The gardens were designed by Capability Brown and have been maintained in his style. I don't like rushing on a Friday. I didn't exactly rush today, but I did have to start a littler earlier than usual. 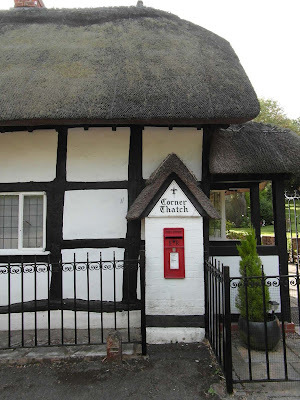 I took the five sacks of Talking News to the Sorting Office, then we drove up to the surgery. Pauline took the car and went to St Peter & St Paul's to arrange the altar flowers. I met my doctor and outlined all my symptoms, hinting what I thought might be wrong, which is a circulation problem. She thought it might be respiratory and so told me to try an nostril inhaler for a month. I will also have a further test next week. Whatever, we agreed that whatever it is, it doesn't seem life threatening, or even restrictive. I walked down to the church - only about half a mile - and then had a pleasant half hour chatting to Ron whilst Pauline finished her labours. Later we did our weekly food shop and I got my inhaler. It may be psychological, but I felt I had benefited from the second application in particular, which came about midnight. Tonight was the 44th Charter Anniversary of Lichfield Lions. This was at the Old School House at Weeford. I was MC, so behaved myself. There were 98 there and our table consisted of two First Responders, two from Queens Croft Special School and four from Saxon Hill Special School. They were all lovely company. The food was good, the speeches not too long and this was a really good Charter. 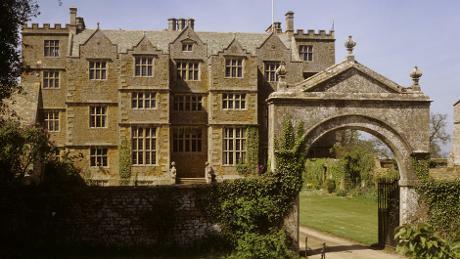 I find it sad that a family can have ownership of a home for 400 years and then have to give it up. However, Castleton House had been slipping into decline for well over 100 years and so it was a blessing when the National Trust took over in 1991. 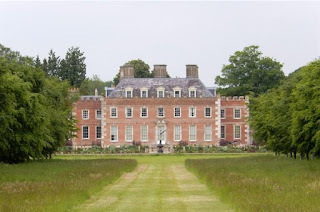 As with Coombe Abbey in Leicestershire, the NT decided that the house should not be over-restored but should be made good enough to be left pretty much as it was, so that visitors could get a true feel for how the family lived. There was a house on the spot long before Castleton House was built, but it is not known for how long or any details of the old property. A lawyer named Walter Jones bought the estate in 1604. He came from a successful wool merchant family but had made his own fortune through involvement with the law. 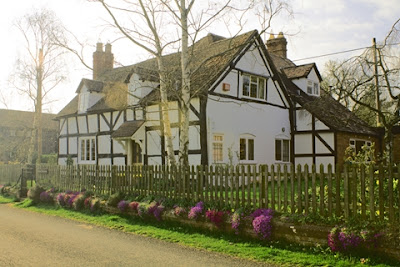 The original house was razed and the current house was built over a five year period, starting in 1607. Cotswold stone was used in the construction of this Jacobean style manor house. Ambitions were high regarding Castleton. 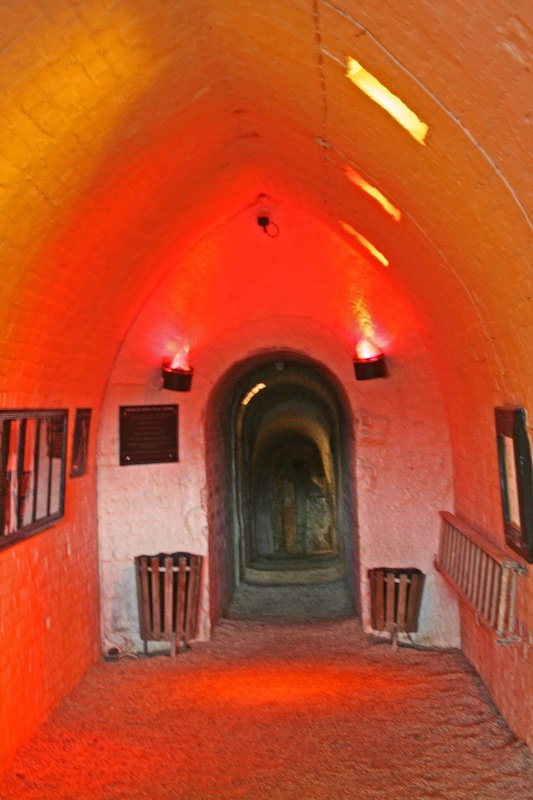 The Long Gallery is certainly that, at 72 feet, and is the longest of all surviving galleries. The Great Chamber could easily have been labelled grand. The house featured in the English Civil War when Arthur Jones was on the losing side in the Battle of Worcester in 1651. Hotly pursued, his wife hid him in a secret closet, allowed a full search of the house and gardens, and then fed the Roundhead troops with drugged beer, as a result of. Which Arthur made his escape. 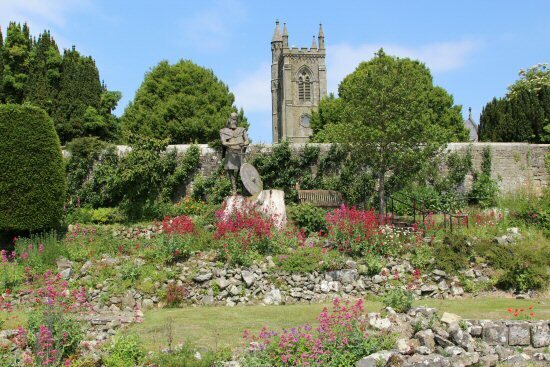 The gardens are not just eye catching, they were laid down in 1612 and are believed to be almost unaltered over the next 400 years. Castleton is a hamlet, thatched cottages and Cotswold stone farm houses. It is north of Adlestrop and east of Moreton in Marsh.